Bullitt was the movie that launched a thousand, maybe even a bazillion car chases. The 1968 Mustang was hot. The 1968 Dodge Charger was hot. 9 minute, 42 second testosterone overload through the precipitous streets of San Francisco — was still enough to ensure that “Bullitt” would become a classic. Now it’s available on YouTube in glorious 1080pm HD! 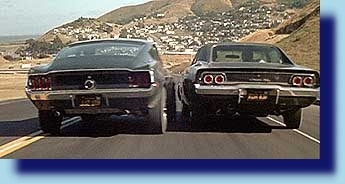 within 3 vehicles, how many vehicles did Bullitt pass (going the same direction) during the chase scene? how many beer trucks were in the scene? Bullitt was also the first car chase done with live natural sound (some sound was added later as needed eg: tire squeal (and it’ obvious in the chase.) The Mustang rear end was blown as one of the stunt drivers was cranking through the gears to be added to the soundtrack. McQueen thought he was good enough to do the stunt driving himself. “He overshot a turn, smoked the tires and everything. It’s in the film. When Steve did that, it wasn’t on purpose. He goofed up, and they said, ‘that’s it, get him out of the car’. The cars were basically stock, the suspension was hopped up on both, and McQueen wanted the mag wheels because he wanted his Mustang to look cool. In real life the Charger ran the wheels off the Mustang on the test tracks. Get this, and imagine trying to film this scene today… there were only two cops on the scene! If you want to know about the chase with photos of the streets then and recently, this site has a good wrap-up. Bonus points: how many cars were involved in the chase? I counted 17. The chase doesn’t begin until McQueen gets behind the bad guys. (McQueen slid in the gravel past the Ford to avoid running over the motorcyclist – debatable if this was a “pass.”) Wouldn’t you think at those “speeds” in San Francisco they would have put more traffic in the way? To a car nut, I would own any one of the vehicles shown in this chase scene: parked or driven. Even the street-car and the Schlitz Beer Truck. Yes-my all time favourite car chase. Anecdote: I had a 69 Chevy Nova with a 396-375 hp which was a real sleeper. Driving over the border one day the American guard said “For a new car it sure is noisy.” I told him about the engine and he said “Why would anyone put an engine like that in a Nova?” I told him I wanted to be like Bullitt only faster. He laughed and waved me through. If that happened at a border today he would have thrown me in jail. 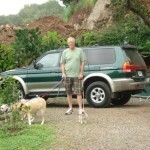 @Kirk: Burned up some tires with that baby I’ll bet! The Nova was a tiny car – 375HP? Whoa! What fun.